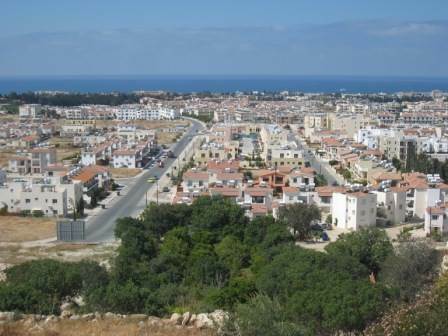 Paphos Town, Paphos - This very charming 2 bedroom townhouse comes with some of the furniture, it is located in a very nice residential area in Paphos town over-looking Kato Paphos with great views of the city and the Mediterranean sea. Located within minutes of the Debenhams roundabout, walking distance to the new hospital and the center of town make this home very conveniently located. The townhouse features a large closed kitchen, a large open living room with a dining room that leads out to the garden and the spectacular views. The top floor has the 2 large bedrooms, balcony and a bathroom . You must see to fully appreciate it.